Input devices: settings of buttons and axes for the various input devices that are used. This is used to set a button or switch, for example a handbrake, to a specific button on a specific input device, or to set an axis to a device like a steering wheel or a clutch pedal. User interface: position and type of user interface. Displays: Display resolution and position of rendering displays. Sound: Sets the folder where the voicemessages and other soundfiles are installed. This option is for multi-language systems. For example, if English feedback is installed and German feedback, then these speech files must be stored in different folders. With this option the appropriate folder can be selected. Force feedback: Sets the strength and type of force feedback on the steering wheel (if a force feedback steering wheel is available). You can use any combination of steering wheels, pedal sets, gear shifters, and button definitions and up to 5 different input devices can be used in this setup. The resolution can be set as well as the screen position where the rendering display starts. In the 1-display and 3-display software versions, the user interface (GUI) is different: in the 1-display system, the GUI is put on top of the rendering surface. Because of this, the GUI is a small version of the large user interface that is used in the 3-display setting. If 3 displays are used for surround rendering of the simulation, a fourth monitor can be used for the user interface. However, it is also possible to add a second monitor in the 1-display version, and put the large GUI on that second monitor. This can be configured with IOConfig as well. A number of different force feedback settings can be adjusted. For example, the steeringwheel torque is computed each frame in the simulation, and this depends on speed, road friction, curve driving etc. The strength of this can be controlled via force feedback settings. The user interface can be either big or small. 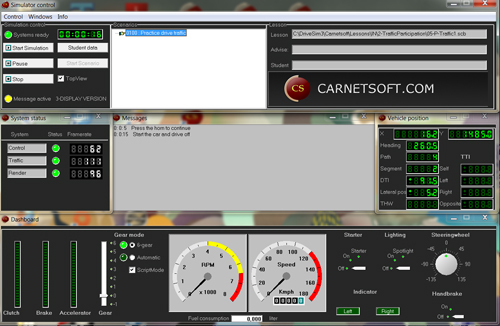 A big user interface is used, if you have an additional monitor available to display the GUI. This is normaly the case in the 3-display surround version. For a 1-display version (for example, a demo system), there’s usually 1 monitor available and in that case the GUI has to overlap with the rendering display. The big GUI shows a lot of information about the current simulation. For example, it shows the messages of the virtual instructor, it shows the results of the lesson in the student assessment system, all kinds of vehicle signals such as clutch position, steering wheel angle, speed, RPM, indicator use, etc. It also shows information like lateral position (position on the road), and time headway (distance to the lead vehicle). You can even show these parameters in graphs and compare these graphs. For example a graph of clutch position and gear to see if the clutch is fully pressed when gear is changed. 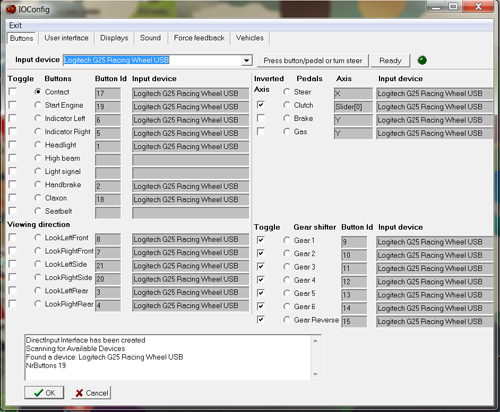 The GUI shows valuable information for any instructor that can be used during driver training. Although the small GUI seems to give less information, all the additional datapanels are minimized on the taskbar, and the operator can get this information by simply maximizing these data panels.